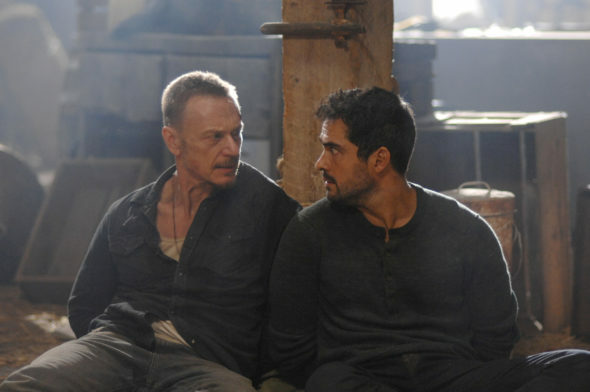 Are Tomas and Marcus able to keep the devil at bay in the second season of The Exorcist TV show on FOX? As we all know, the Nielsen ratings typically play a big role in determining whether a TV show like The Exorcist is cancelled or renewed for season three. Unfortunately, most of us do not live in Nielsen households. Because many viewers feel frustrated that their viewing habits and opinions aren’t considered, we’d like to offer you the chance to rate all of The Exorcist season two for us here. A FOX horror drama, The Exorcist stars Alfonso Herrera, Ben Daniels, Kurt Egyiawan, Zuleikha Robinson, John Cho, Brianna Hildebrand, and Li Jun Li. Christopher Cousins and Cyrus Arnold are recurring, this season. The series is based on the 1973 feature film and William Peter Blatty’s 1971 novel of the same name. In the second season, Father Bennett (Egyiawan) sets out to uncover evil at the Vatican, while Marcus Keane (Daniels) and Father Tomas Ortega (Herrera) set off to assist troubled foster children, in the Pacific Northwest. What do you think? Which season two episodes of The Exorcist TV series do you rate as wonderful, terrible, or somewhere between? Should FOX cancel or renew The Exorcist for a third season? Don’t forget to vote, and share your thoughts, below. 5/11/18 update: FOX has cancelled their low-rated TV show, The Exorcist, after two seasons. Details here. More about: The Exorcist, The Exorcist: canceled or renewed? PLEASE RENEW THE EXORCIST FOR SEASON 3! Please!fox! Really good show!! Would love to see a season 3!!!!!!!Plz!!!!!!!!! This show is smart TV. The writing, acting, and content is just over the top. That’s why they cancelled the show. Not every viewer wants to see dummies parade across the tv screen. Bring it back!!!!!’!!! The Exorcist TV show is Amazing !!! Please don’t cancel it. One of the best shows ever!!! This show got me excited about T.V again…..a true horror fan at heart there is not much on to aplease that these days….the slick writing brought a fresh take to the subject of exorcism…..the show was complimented by amazingly talented actors involved…making it gritty and scary as hell…..the only let down was fox not maketing it better which was ultimately it’s down fall…..get it to the right audience and they will love it as much as I do…. The Exorcist is simply the best horror show on any network. Since it’s cancellat I would love to see AmazonPrime pick it up for streaming. It’s much too good to just be plopped in a pile of terrible shows. Please pick it up!!! @primevideo! PLEASE RENEW THE EXORCIST FOR SEASON 3! GREAT HORROR TV SHOW! What can i say about this show? I love it! I am looking forward to season 3. Please keep this horror show going. We need more of these shows instead of always reality shows!